If you are thinking that internet is available at everywhere then you are wrong. Two-thirds of the world’s population living without Internet and for those peoples google started the big project that is the Google Loon. This is especially for the peoples who are residing on rural areas.Loon is the network of balloons which provides the Internet and which moves on the edge of space. It will travel around 20 Km above from the earth surface in the stratosphere where wind speed is about 5 to 20 mph. Management of balloon will be done from the earth. It will provide the internet in 40 Km scanner area of balloon. All the circuit and antenna devices placed in the bottom of the balloons and it will contact to the another balloon and to the antenna placed on the earth. One more interesting thing is it will get the energy from the sun by attached solar panel on the balloon and by only getting the four hour sun light it will produce energy which will be available for whole day. Loon Project begin in June 2013 in New Zealand. In the South Island Thirty balloons, launched to test it. It was tested by small group of pilot testers and from the experiences of the group of pilots the next technology shape will be given to the next phase of the Loon. 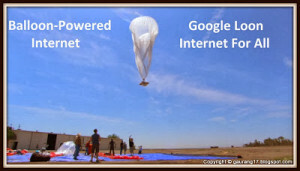 Get more ideas on project at Loon. Share your thoughts on this biggest awaited project.